On Saturday gamers arrived as early as 9a.m! Gamers were getting out all their rigs from their boxes and just accessories, like the cherry on top of a milkshake. Set-up was completed and the LAN matches between the players were well away. Online multiplayer, multigame matches on different platforms. This right here is what PSG is all about! The room's atmosphere was riddled with loud badgering and friendly banter as the gamers got riled up competing with each other. As everything settled down and all the gamers were present, the main Rainbow 6 Siege tournament took off without a hitch. The tournament was on going until the socket power went out. Not only were the gamers using a ridiculous amount of internet speeds but, also crazy power output! 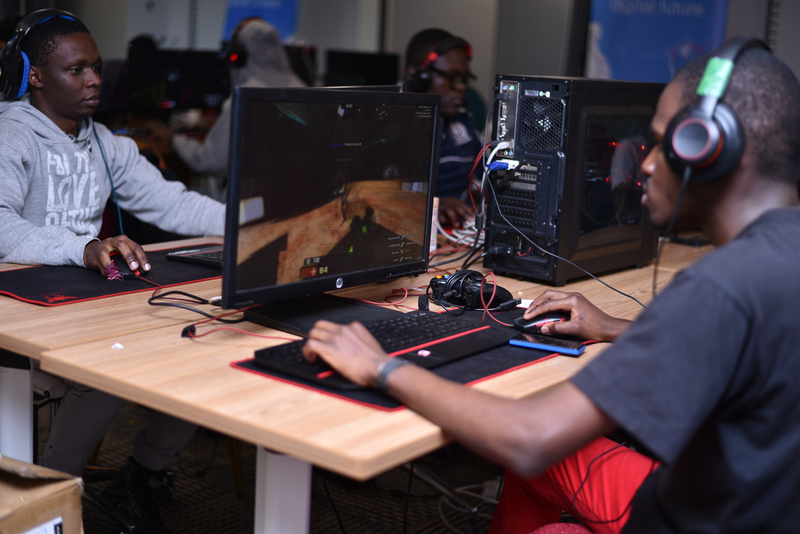 Everyone was livid and disappointed but, Liquid Telecom set the gamers up with the LAN cables. Some players stayed and took advantage of the sockets in other areas of the venue and LAN connections around the lobby and kept on playing. With power restored on Sunday morning, gaming resumed. Once the gamers heard this, they immediately made it back to the event and new gamers joined in for yet another day of pure gaming. The gamers requested we hosted a Xonotic tournament. This was great to do as the numbers were large. At the end of the tournament, surprise awards were given away. The first seven received smart phones and another six received Safaricom airtime courtesy of Blaze. We played host to another 2v2 rainbow six siege tournament on PS4. The highlight of this was a brother and sister team challenging gamers. The gamers ended giving up after realizing the sibling team were on level platinum 6 and will never be beat. 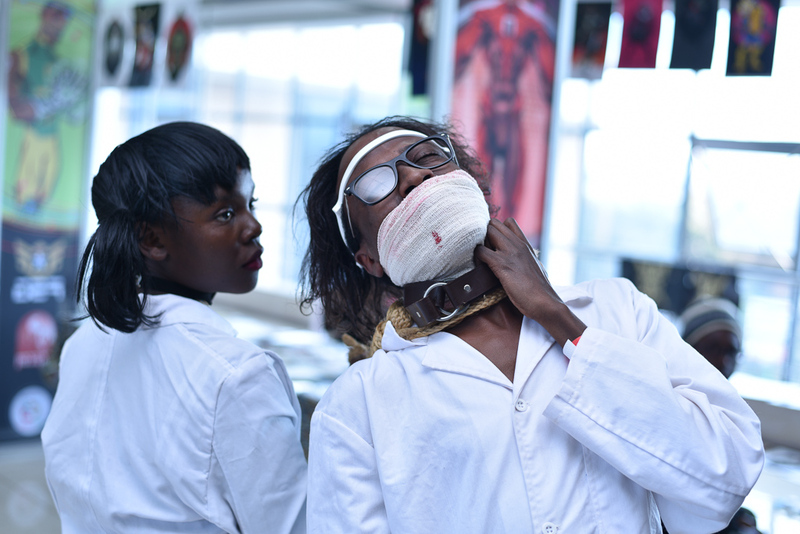 Asylum 2018 was a new and exciting frontier for the Kenyan cosplay scene. The Cosplay Competition was the epitome of the workshop session. There was a number of awesome costumes that were showcased ranging from Maleficent with her extending wings, Predator with his full armor complete with infrared eyes and Roronoa Zorro with his 3 swords and wine bottle. We highly applaud each and every cosplayer for the work they put for the cosplay competition. It was quite evident that most of them had gone out of their way and taken time to seriously prepare and well represent their character. We had 29 entries for cosplay but only 18 cosplayers showed up for pre-judging. The cosplayers went above and beyond and so they were awarded courtesy of Asus and Blaze by Safaricom. First place (Judy Ogake) won 60,000 KSh, 2nd place (Effie Wambui) 30,000 Ksh and 3rd place (Esselink Wanjohi) 10,000 KSh. This year we borrowed a leaf from the judging criteria for the World Cosplay Summit (WCS) and the cosplayers were judged based on costume accuracy (40%), construction (40%) and presentation/roleplay (20%). We highly applaud the judges for the great work they did in conducting the highly competitive cosplay action. animation and film in general. 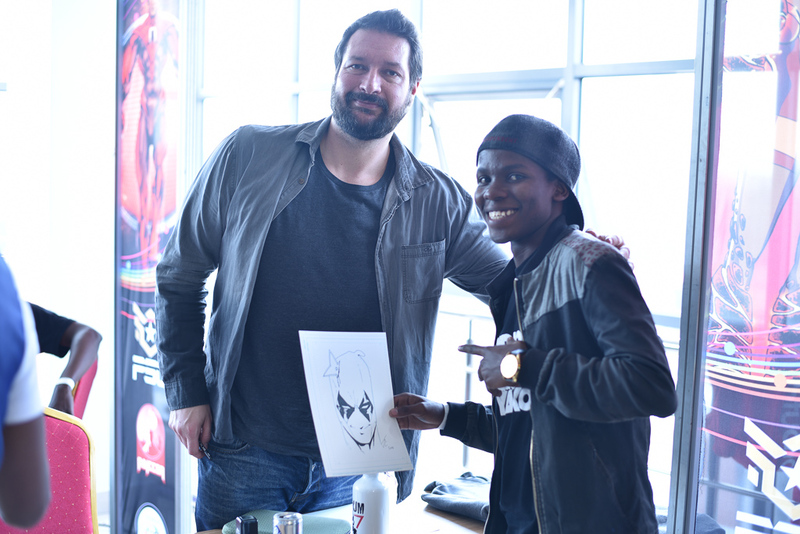 Our main highlights had to be when Jason Master decided to give away his priceless sketches. Fans went crazy and only the first six fans would walk away with literally assets to keep for years to come and the assets grow in value too! We also had Nick Wilson! He came in to represent Annecy in the animation pitching competition. This was a great competition to attend and to participate. As an attendant, we noted the skilled young animators in Kenya that need the exposure and told great stories. Whereas, as a participant, it was great to have a professional to come through and judge your work and give you direct feedback. All-in-all everything run smoothly and we are so glad we could witness such talent being recognised. The winners of the Annecy pitching completion were Shadrack Munene III and Salim Busuru from Avandu Studios. In November 2018, these two will be going to Johannesburg, South Africa for the continental finals. There, they will battle it out once again against another eight people. Out of the ten, only two will be chosen to go to France and represent Africa. This is a great opportunity and we hope to be bringing more and more like these. Congratulations once again to Shadrack Munene III and Salim Busuru and all the best as you go forward in the competition. The film workshop proved to be one of the most loved by our audience! It indeed had more to offer than the average workshop! We had two screenings showing and these included Fupi – Toons and Supa Modo. With the screening of Supa Modo, there was not a dry eye in the room. The story is fantastic and the production was very consistent with the various other releases such as ‘Nairobi Half Life’. Fupi-Toons are a showcase of short animations from around Africa. Animators submit their animations and only the best are chosen. These are then packaged into a 90 minute edit called Fupi-Toons. Once again, what talent we have in Africa and this needs to be exposed and explore even more. A big thank you to Nick Wilson, Jason Master and all the other panellists for coming to the event and making it that much more enjoyable and professional.